Something amazing happened. A weird kid named Dwight made an origami finger puppet of Yoda. (That wasn't the amazing thing--just typical Dwight weirdness.) the amazing thing was that Origami Yoda gave great advice. He could predict the date of a pop quiz, tell a guy if a girl likes him or not, and keep kids from embarrassing themselves in a dozen different ways. Most of the sixth graders were convinced he was using the Force. But now, a year later, it's a dark time at McQuarrie Middle School. Dwight has been suspended and may be expelled, which means no more Origami Yoda. 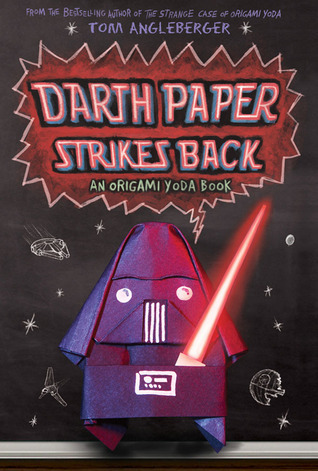 Even worse, Darth Paper, a puppet created by Dwight's nemesis, Harvey, has taken Yoda's place. He spews insults and evil and just may be responsible for getting Dwight kicked out in the first place. Now the kids of McQuarrie are trying to build a case to save Dwight. This is their case file. Hi. New follower from the hop.